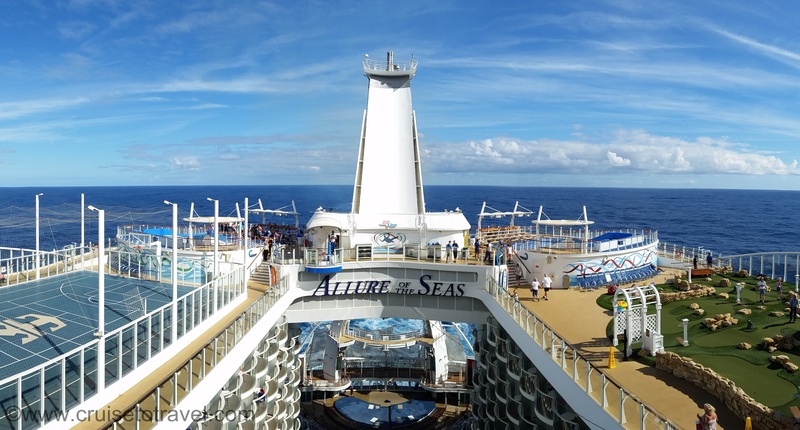 On our previous Atlantic crossing onboard Allure of the Seas we participated in our first ever cabin crawl. 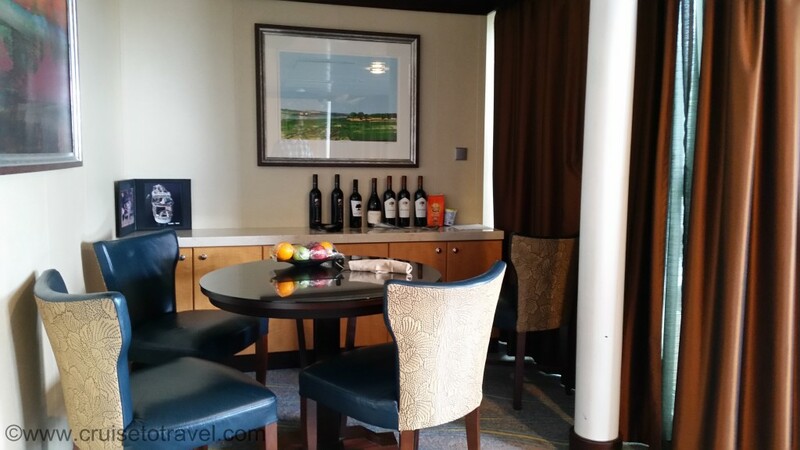 We had so much fun exploring the different types of cabins that we decided to make this a regular event while on a cruise. So today we participated in our second ever Cabin crawl! 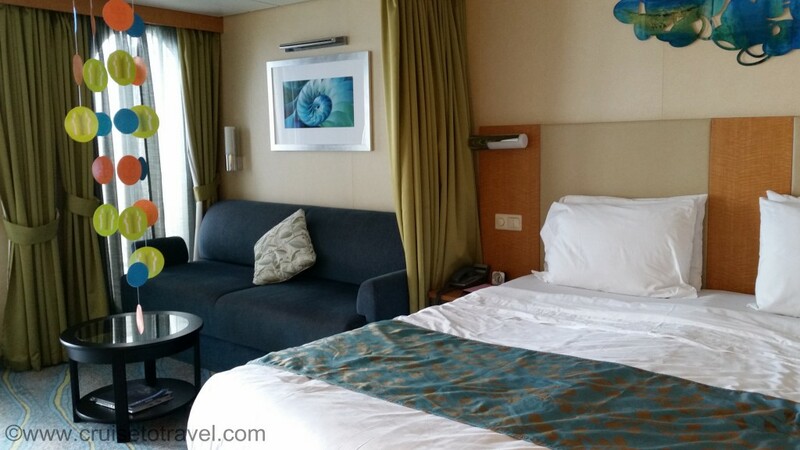 A cabin crawl is an event which is organised by cruise passengers themselves. 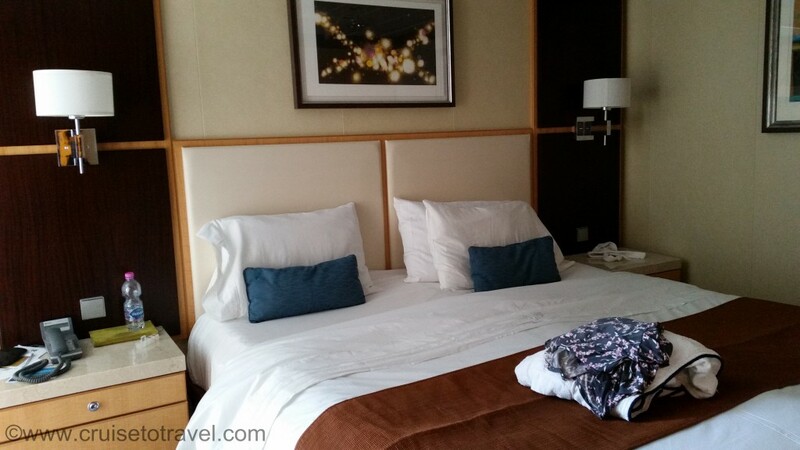 It gives you a chance to meet fellow cruisers while visiting their staterooms. 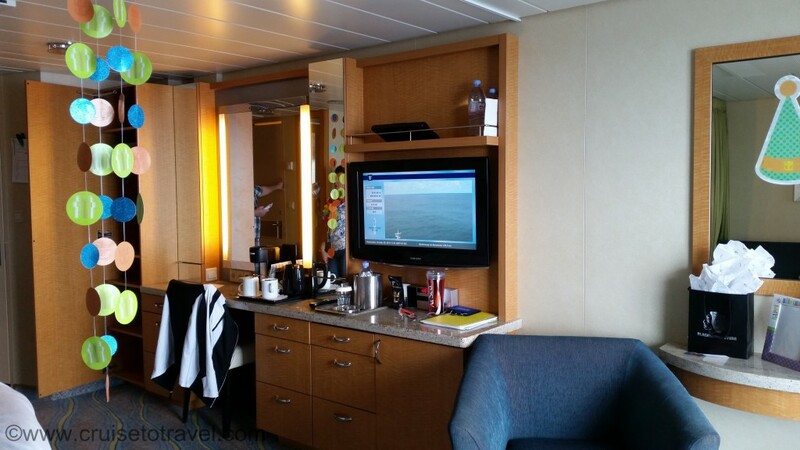 This way you get to see a variety of cabin types ranging from insides to suites. As was the case in the previous cabin crawl not everybody opens up their cabin to visit, something which would have been impossible as there were too many cabin crawlers anyway. 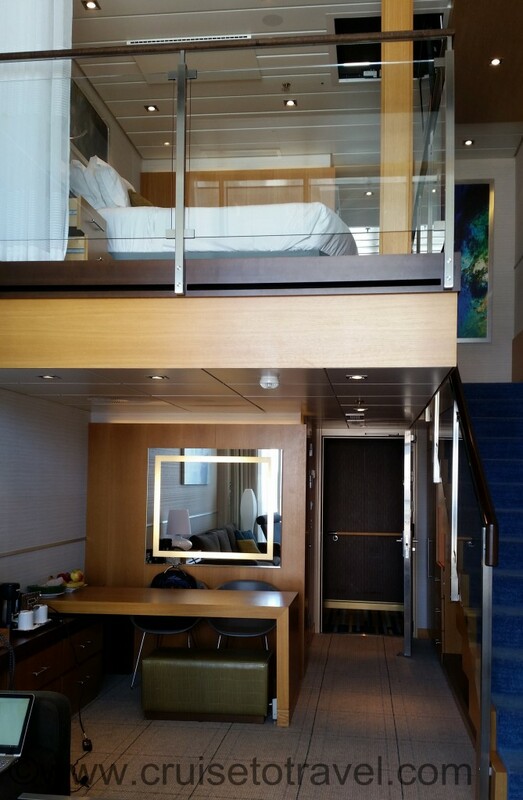 Let’s start with our own regular balcony cabin. 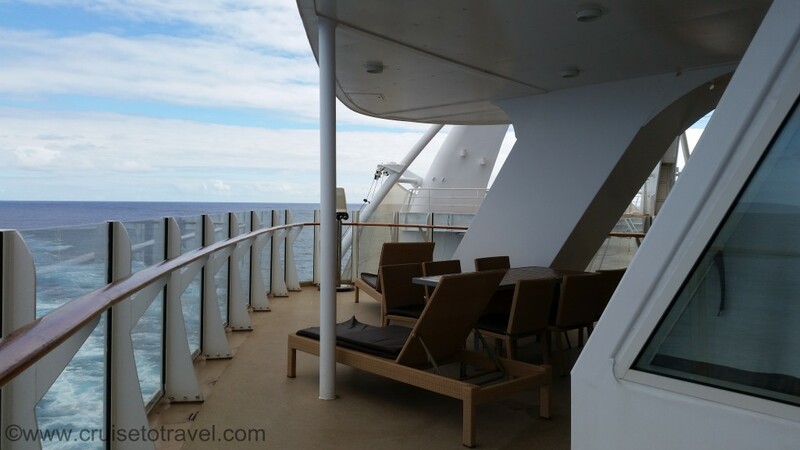 The main difference between our cabin and the inside or oceanview cabins of course is that the cabin has a balcony versus no view or a window. 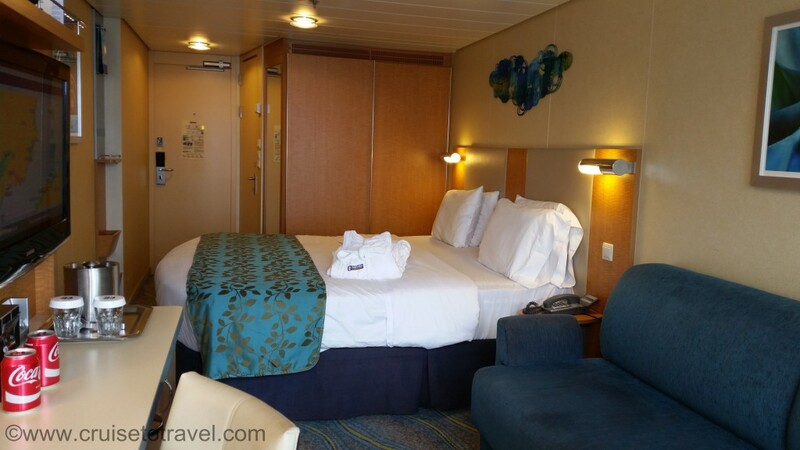 Another difference is that, in the other staterooms, the bed is sometimes set against the back wall. Disappointed we went on our way to see the next cabin, a Grand Suite. 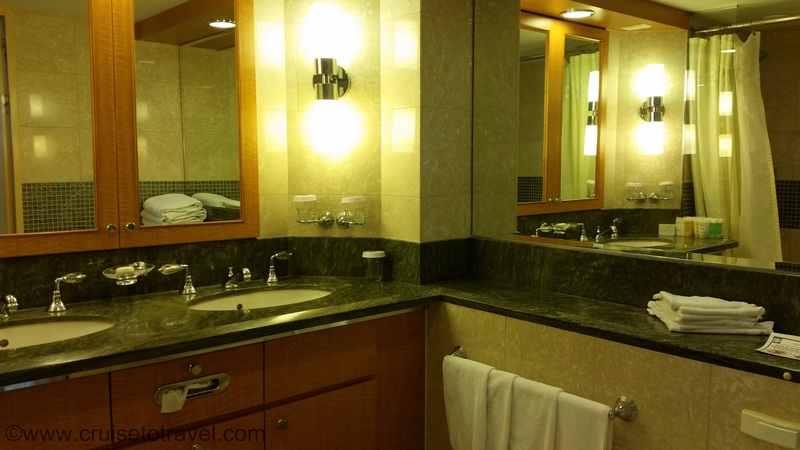 About double the size of a balcony stateroom, the Grand Suite offers a marble entrance that leads into a living area and seperate bedroom, a large marble bathroom and extra perks (concierge, lounge, restaurant, sundeck,…). Visiting the grand suite brought back fond memories of our Transatlantic crossing onboard Mariner of the Seas in 2013 when we, thanks to the upgrade fairy, stayed in a Grand Suite ourselves. 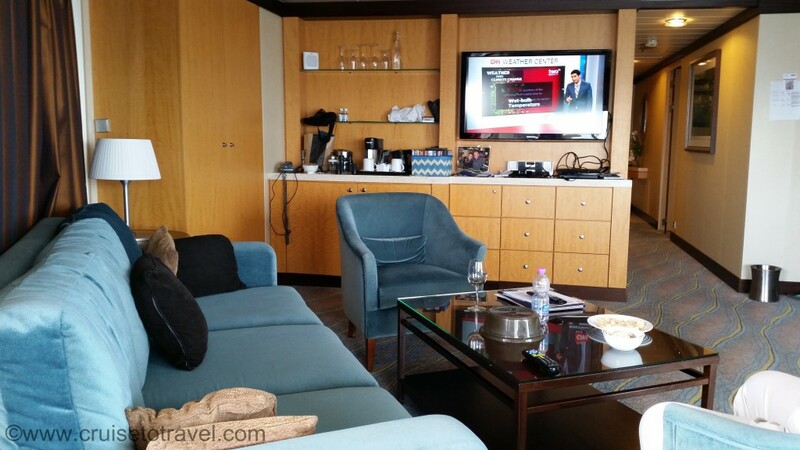 Thinking back of when we were showing off our Gold Card, proof that we were also staying in a suite, we went off to our next destination, another Grand Suite at the back of the ship. 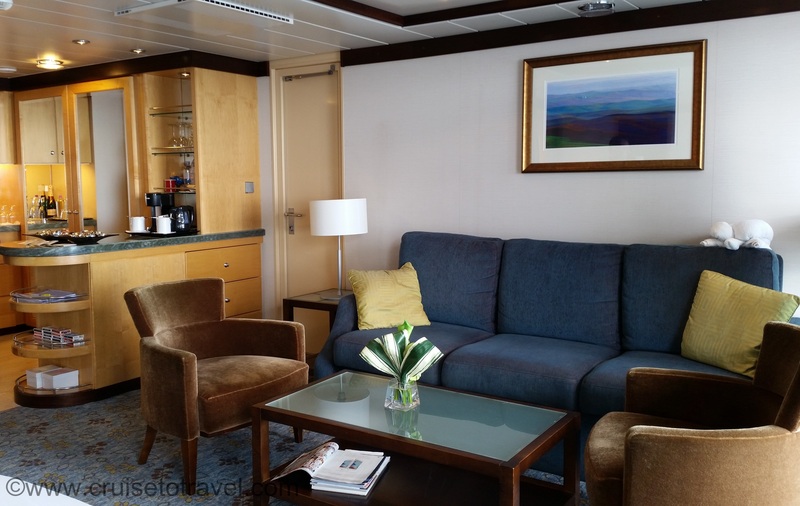 Stateroom 12730, soon to be categorized as an Aquatheater Suite, is one of the suites that were added during the drydock earlier this year. 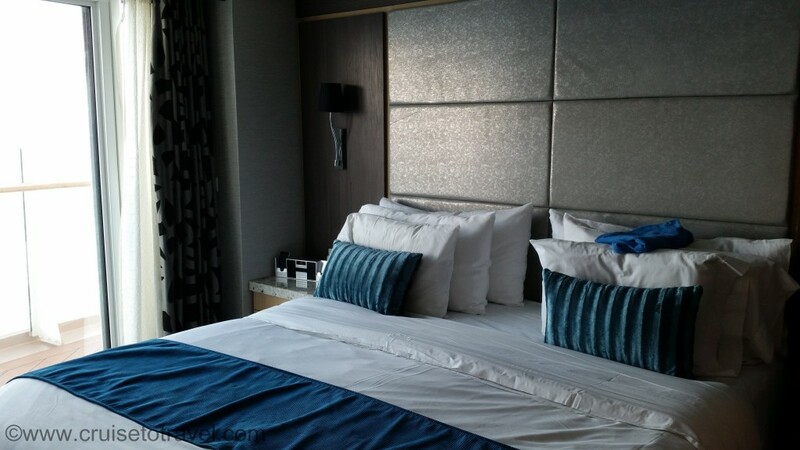 We were glad to see that all the noise and dust that we encountered during our crossing on Allure in April resulted in some really nice staterooms. 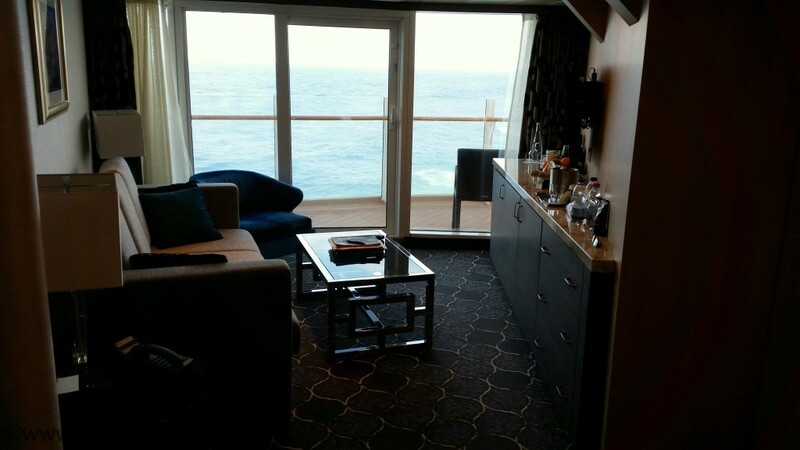 Though the suites themselves are pretty awesome, the one thing that sets them apart from the other suites is the balcony. 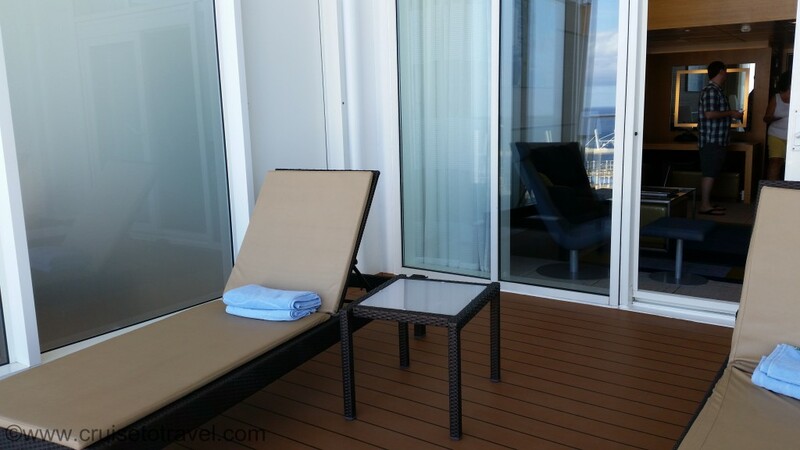 The balcony wraps around the suite overlooking the ocean and the Aquatheater. 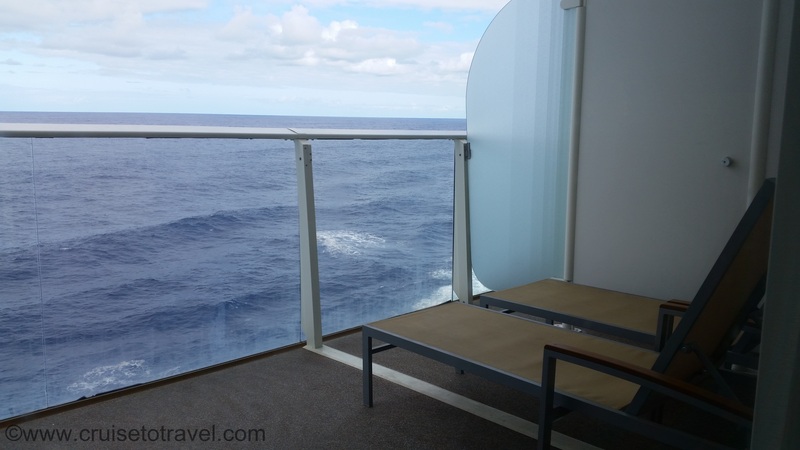 Unfortunately though you get the best seats in the house to view the aquashows, the balcony offers no privacy at all, which is probably why we never saw anybody on those balconies. A few floors below we visited another, but bigger, Aquatheater Suite. Entering stateroom 8730 through the marble entrance hall you walk by the 2 bedrooms, each with their own bathroom, into the big living room with seperate dining area. 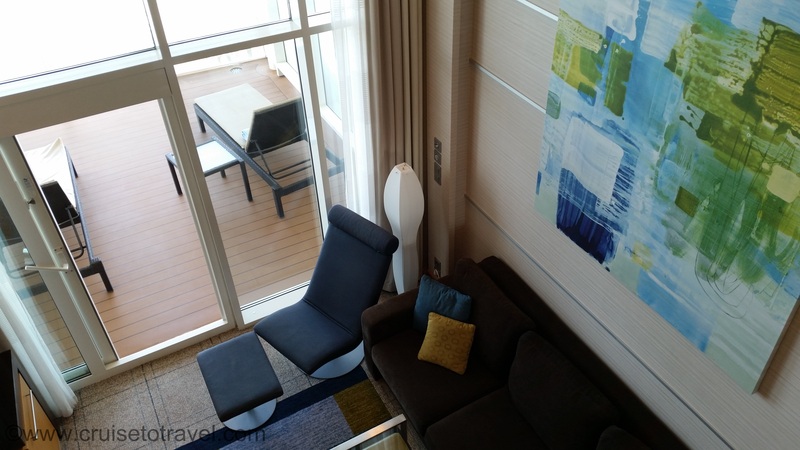 The floor to ceiling windows open up to a huge balcony offering the best views of the ocean and the Aquatheater. 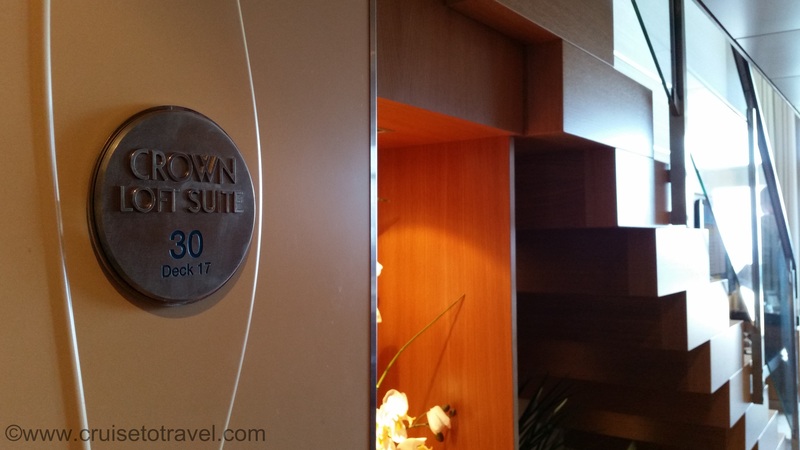 We finished our cabin crawl with a visit to one of the Crown Loft Suites. 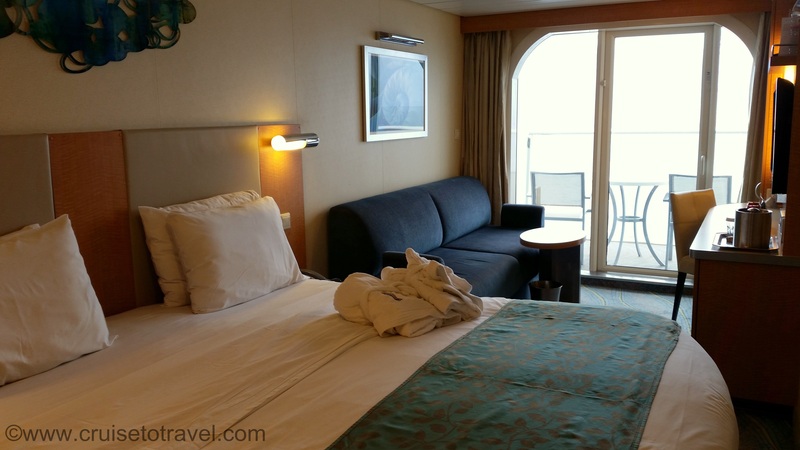 These two deck high staterooms offer panoramic views of the ocean or the ‘sports’ area of the ship (the sports court, miniature golf, zipline, flowrider). The main level of the Crown Loft Suite features a bathroom, dining and living area, while the master bedroom and bathroom can be found on the second level. 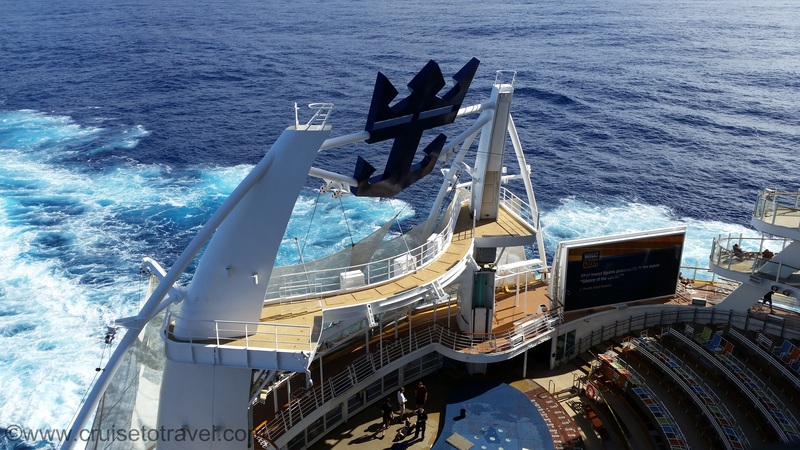 As a cabin crawl is usually organized at the beginning of a cruise, it is a great way of meeting new friends and learning to find your way around the ship. 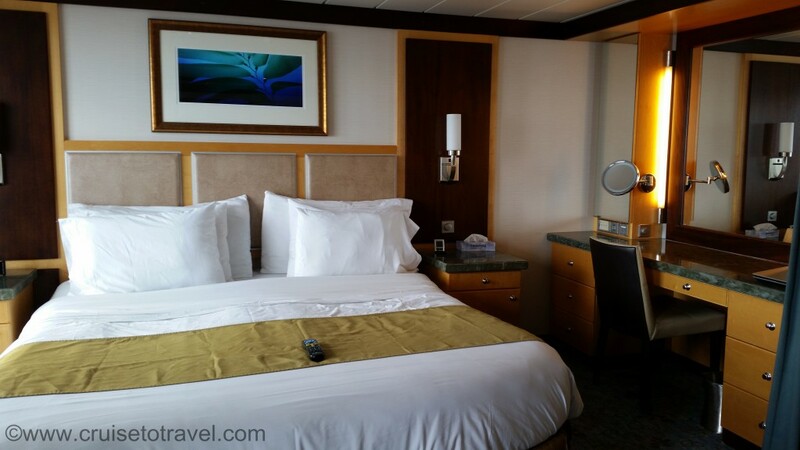 It’s also a fun way to find out what the differences are in stateroom categories and the general pros and cons of certain cabins. 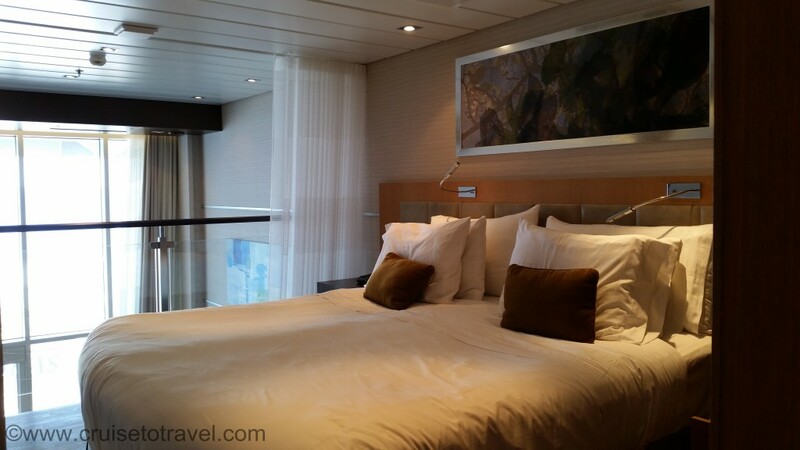 That way deciding upon which cabin to book for your next cruise becomes a little easier. This being said, seeing all these wonderful staterooms one could easily start to feel a little jealous of the people staying in them.